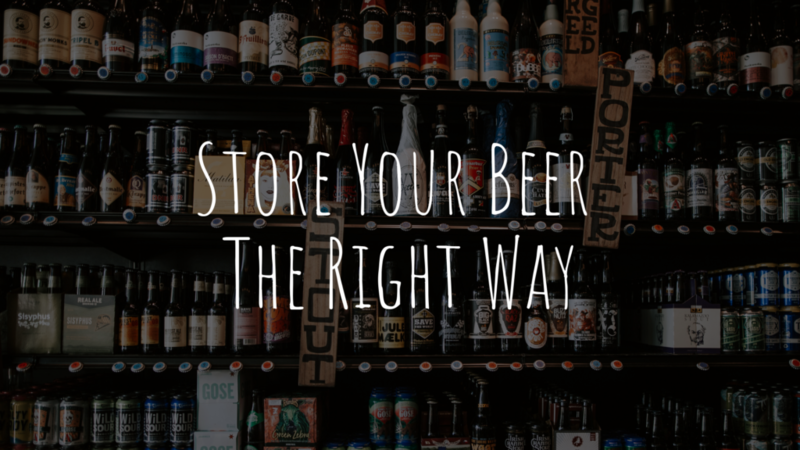 After finding your perfect beer, it’s time to take the necessary steps researching the correct storage to ensure the brew stays fresh and flavorful for as long as possible. Different beers will need to be stored differently and for different amounts of time, but there are still some general rules to follow. Natural light sources hitting your beer will interact with acidic hop compounds found in your beer called humulones. And, it doesn’t take long for this chemical reaction (also known as skunking) to happen – after just a half an hour outside in direct sunlight can hurt your favorite brew. While basement and pantries are often a favorite storage location for beers, you must also keep in mind that any light streaming into these spaces could have a negative effect on your beer. Just like direct sunlight, high temperatures can make your beer lose flavor and make it go stale quicker (even in just one day!) But, beer can withstand some moderate temperature swings for short periods of time, so don’t worry about the car ride home from the store just remember to put it somewhere chilly as soon as you’re home! Fridges kept around 34 to 36 degrees Fahrenheit are the best places to keep your beer fresh, longer. By storing your beer upright, you are minimizing the size of the beer’s surface which is coming into contact with air trapped in the bottle. The less contact your beer has with air, the less oxidation takes place which means your beer will taste fresh longer. While these rules contribute to the freshness of any beer, different beers can be stored under different conditions for different lengths of time. When these high alcohol content beers meet these conditions, there is usually still some active yeast which slowly eats at the beer and causes a positive aging process. Beer experts note that cellaring these beers for around 3 to 5 years can actually cause the brews to develop new levels of flavor complexity like chocolate, leather or dried fruits. The correct storage is especially important for craft beers and IPAs since they often have a stronger aroma. The longer they sit around, especially in the wrong kind of conditions, the faster they will lose their smell and then their flavor. Keep in mind that these kinds of beers, even with an even higher ABV than 8% still fall in this category. Bottled beers can be tricky to store. A lot of them are very sensitive to direct sunlight especially green and clear bottles. However, brown bottles are slightly more successful in blocking out the harmful rays, so storage is not quite so difficult. But, placing them in the fridge is still your safest bet! Beers in cans are pretty durable, especially against the effects of direct sunlight, since the cans can block out UV light entirely. So, whether in your basement, pantry, or in the fridge your canned beer will stay fresh until you’re ready to drink it.